The Santa Fe Opera is highly respected not only for the caliber of its performances and its stunning location, but also for taking creative risks that continue to push this art form into the digital age. 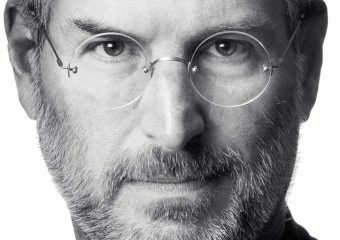 Why not commission an opera about Steve Jobs? He set the stage for how we communicate with each other and the wider world, and is something of a saint to the younger generation. It seems a good time to examine the legend, both his accomplishments and his personal foibles. 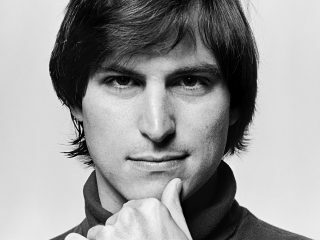 I have always greatly admired Steve Jobs for his amazing creativity and holistic understanding of design. It’s an approach we try to emulate at La Fonda, as in our just-completed renovation. Design that is simple but intelligent, appealing but also authentic has been our M.O. as we shepherd a historic icon into the 21st century. Unlike Steve Jobs, though, I have never felt that striving for perfection has to come at the expense of personal relationships, especially with members of our team. The balance between creativity, innovation, and human relationship is one we all face in a time of rapid change—which is why the Opera production seems so timely. Santa Fe is loved for its cultural diversity, but this very mixing of ethnicities has become a flashpoint in American politics. Visitors are drawn to our city because we hold so faithfully to the past, but we also struggle to bring New Mexicans into the 21st-century economy. At La Fonda we continually have to balance the desire to stay the same against the risk of leaping creatively into the future. In the hospitality business, though, it’s not possible to leave the human element behind. No innovation or renovation can be so clever or revolutionary that it leaves people feeling unwelcome or overlooked. That means we will probably always fall far short of perfection—but there is more to being great than being perfect. Even the greatest act of creative genius can feel hollow if it leaves behind human connection and kindness. And I’m guessing, without having seen it, that this is what the viewers of The (R)evolution of Steve Jobs will discover onstage at the opera this summer. The Santa Fe Opera may still have tickets available for this compelling look at Steve Jobs and La Fonda is also offering a special that will include a backstage tour. If you happen to be in town, stop by our gift shop, Detours at La Fonda, on Saturday, June 17th for a special in-store event with Los Poblanos. 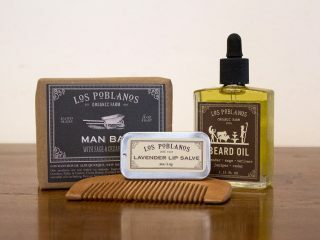 The historic inn and organic farm Los Poblanos, in Albuquerque’s North Valley, grows the lavender that goes into its artisanal products, from lotions and salves to soap and sachets, including the perfect grooming accessories for Father’s Day gifts. 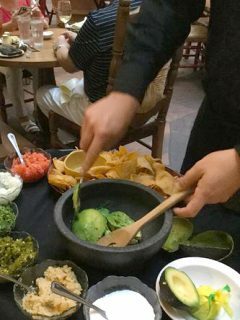 Learn about how these products are made while you also sample Los Poblanos Farm Foods collection, which offers the flavors of the Rio Grande Valley. Stop by and enter to win raffle prizes from both collections! Crafted with care in small batches, Los Poblanos artisan lavender products have a real sense of place. 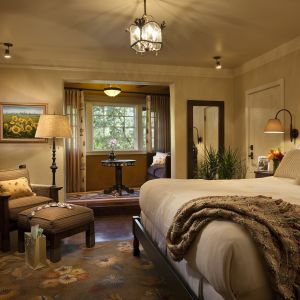 Each product carries the story of the family-run organic lavender farm and historic inn. 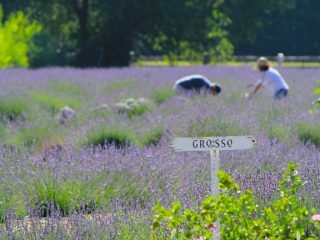 The fields are tended by hand and harvested at the optimal time to yield the highest-quality essential oil. 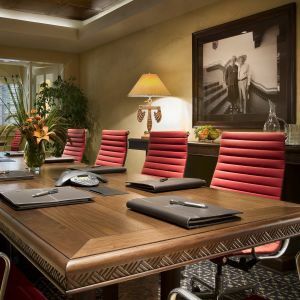 Los Poblanos and La Fonda share the influence of architects and artisans that contributed to both properties. Come enjoy this special event to experience the best of New Mexico. 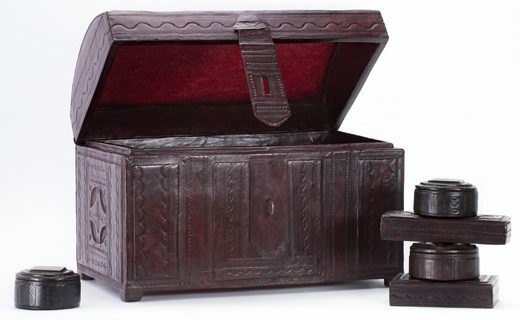 And while you’re in Detours, also check out our collection of beautiful, hand-tooled leather boxes for Father’s Day or any day. Hand-made by the Tuareg tribe in Africa, these boxes make great gifts or gift containers, and come in a variety of sizes. We will also be featuring new ceramics from Kelly Jo Designs. Do stop by! Preheat your oven or toaster oven to 400° . Peel and discard papery outer layers of garlic bulb. Cut 1/4 to 1/2 inch from the top of the cloves and bulb, exposing the garlic. Place garlic on foil and drizzle a few teaspoons of olive oil over each exposed head and cover the bulb with the foil. Place in muffin pan or on baking dish and bake to 400° for 30-35 minutes, or until cloves feel soft when pressed. Cool and scoop out garlic cloves for use in guacamole. Save what you don’t use and spread on a good crusty bread. Place first 6 ingredients in large mixing bowl and smash with wire whisk or wooden spoon so it stays a bit chunky. Serve with tortilla chips or as a side to any of your New Mexican dishes. If you think you’ve seen every bar band that plays Santa Fe, here’s something a little different. The Zigzags are a new act in town, though they may have a familiar sound. Bandleader Henry Sutro is a veteran of the local music scene—in Los Angeles, that is. 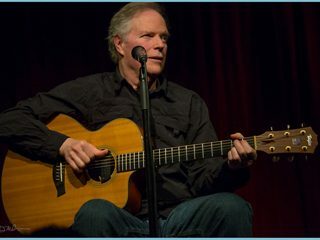 He moved to Santa Fe last summer after 20 years away from performing while he raised his family. On stage with him now at La Fiesta Lounge are a father-son team native to Santa Fe. Guitarist Mike Montiel has spent three decades playing with such local groups as Whiskey River Band, Ozone Express, The Jakes, and his own trio. He has a CD out called Lucky 13. The younger Montiel, Jake, plays bass and is starting to make a name for himself locally on guitar as well. He probably means east—but everything is east when you’re from L.A. 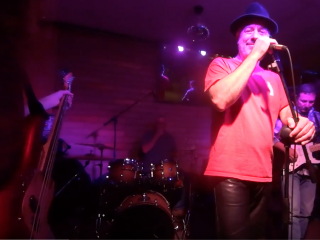 The Zigzags play La Fiesta Lounge on June 16 & 17. Check out some of the band’s videos on YouTube, where you can also see Jake and Mike noodling on guitars. Just be careful not to confuse the band with all the other ZigZag acts—the pop band from Indonesia, the African high-life band from Zimbabwe, or the heavy metal trio out of L.A.—none of which want to talk much about the origin of the popular name. 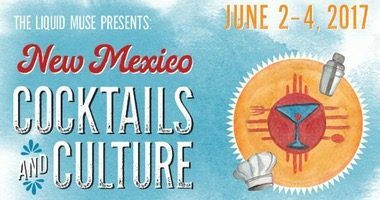 Shake things up as Santa Fe explores the art of the mixed drink, from the Margarita Trail Taco Wars (June 2) to a 40-mile bike ride led by a master mixologist (June 3). Then festival season begins, headlined by the International Folk Art Market and Spanish Market in July. 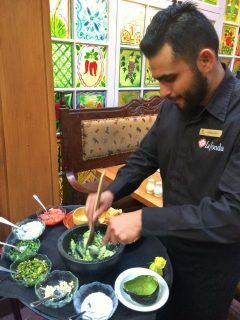 Indeed, the Cocktails & Culture festival (June 2-4) has expanded in its third year, adding more events that showcase the creativity of our bar professionals. Leading up to it is Santa Fe Cocktail Week (through June 2), in which dozens of mixologists compete with their own signature cocktails—of course you’ll start at La Fiesta Lounge and vote for Best Cocktail and Best Bartender of the Year on the festival website. 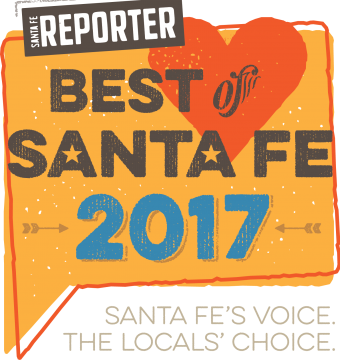 You can vote for us again at the Margarita Trail Taco Wars, where La Fiesta Lounge will be pairing a special margarita with Chef Lane Warner’s own “spirited” taco dish (June 2) at the Santa Fe Convention Center Courtyard from 6pm to 9pm. 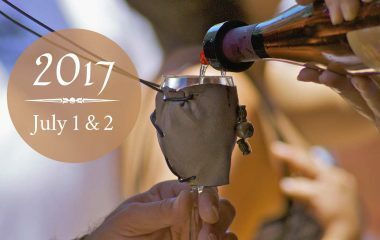 Besides cocktails, Santa Fe celebrates its oldest beverage at the 24th annual Santa Fe Wine Festival (July 1-2) at El Rancho de las Golondrinas. The Lensic’s annual wine-paired dinner lets you dine onstage to entertainment and a live auction (June 24). 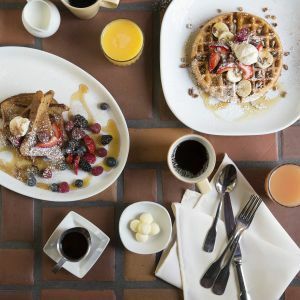 And you can have a little art with your nibbles at the annual Edible Art Tour (June 9-10), when galleries team up with restaurants to offer a taste of both. 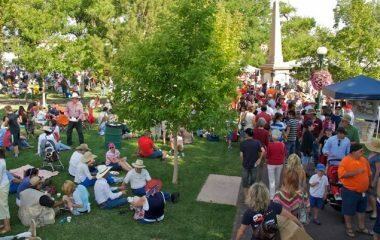 On Independence Day, take part in a 42-year tradition when you start your holiday with Pancakes on the Plaza (July 4), including entertainment and vintage cars on display. The largest event of its kind, voted the Best Art Festival by USA Today’s Reader’s Choice Awards, the International Folk Art Market (July 14-16) hosts 150 master artisans from 54 countries for a weekend of shopping, demonstrations, exotic foods and fun on Museum Hill. Tickets to the market may be purchased here. The opening-night party is a social highlight of the summer, and volunteering is a great way to get involved behind the scenes or tickets may be purchased here. 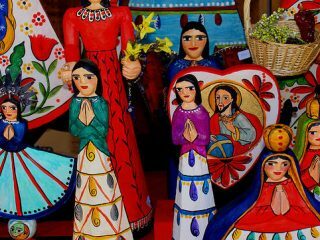 This is followed by the 66th annual Traditional Spanish Market (July 29-30) on the Plaza, with some 250 artists from across the region showing wood carving, tinwork, colcha, retablos, and other media with a Spanish Colonial lineage. Events take place through the week leading up to market; check back at the website for updates. 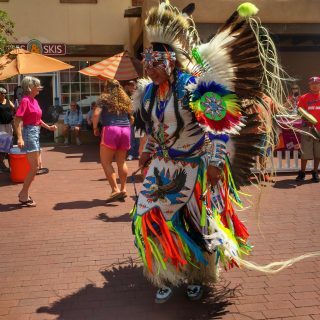 Visitors who plan their trips around it need no reminding that the summer culminates with Santa Fe Indian Market (Aug. 19-20), which brings to town more than a thousand of Native America’s finest artists and some 100,000 visitors for a weekend of mad collecting and total immersion in Native art. Book your room now as many hotels can be booked a year in advance. 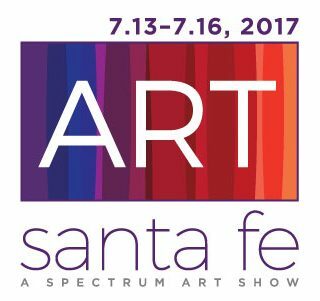 Another venerable art fair is the 17th annual Art Santa Fe (July 13-16), which attracts contemporary art galleries from around the world to the Santa Fe Convention Center for a four-day juried exhibition, with artist events and an opening-night preview party. 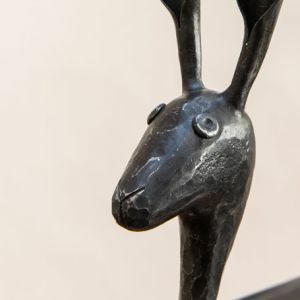 SITE Santa Fe is also holding a silent auction of contemporary art at Charlotte Jackson Fine Art, to benefit the museum (June 23). And the Currents New Media festival (June 9-25) begins its 7th year showcasing video, animation, installation, computer art, gaming, robotics, and other emerging art platforms at venues around the city. For a more humble art-buying experience, stop by the Scottish Rite Temple for an auction of birdhouses, bird baths and other bird art donated by local artists to benefit the homeless (June 4). The newish Objects of Art show features more than 70 exhibitors in fine art media as well as furniture, books, fashion, jewelry, and textiles from around the world, at El Museo Cultural (Aug. 10-13), with a gala the first night. The same producers are behind the Antique American Indian Art Show, which follows (Aug. 15-18) at the same location. 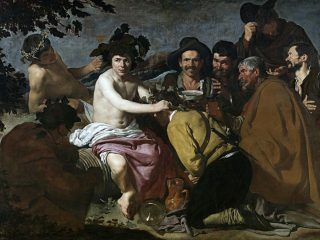 Don’t forget that we are treated this summer to The Prado in Santa Fe, a free exhibition in Cathedral Park featuring 92 full-scale reproductions of the greatest masterpieces from the Museum del Prado in Madrid. Likewise, PhotoSummer, a collaborative exhibit and programs from Center, explore the theme of Art & Oppression, and officially launch June 9 with a reception. 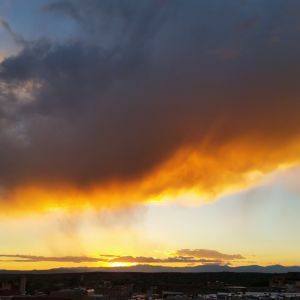 Check out their calendar of workshops and events in Santa Fe and Albuquerque through September. 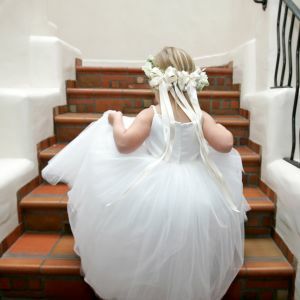 Another up-and-coming event, Santa Fe Fashion Week (June 8-10) puts Southwest and Western design on display with a Garden Fashion Show and Runway Fashion Show. 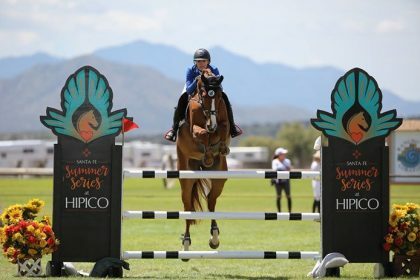 Equestrians already know that Santa Fe is the site of an A-rated hunter/jumper competition (July 19-Aug. 13) with live music, horse art, and parties at Hipico Santa Fe. Competition is free to watch and runs Friday through Sundays. A little rougher in the saddle, competition cowboys come to ride in the annual Rodeo de Santa Fe (June 21-24), which begins with a parade Saturday (June 14) through downtown Santa Fe. 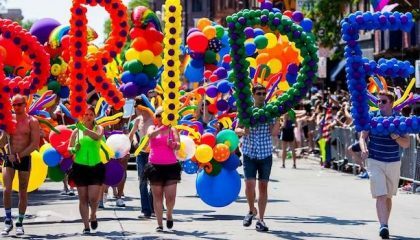 The City Different will be parading its rainbow colors later this month with the annual Pride parade and festival (June 24). 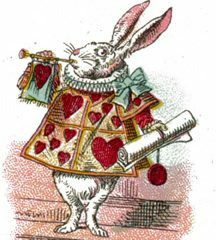 Fall down the rabbit hole or through the looking glass at the Mad Hatter’s Tee Party, where Railyard Park is transformed into mini-golf scenes from Lewis Carroll’s books (July 14-15), created by students from May Center for Learning. Take a strenuous hike of the Jemez River Valley on a tour of Zia Pueblo agricultural fields in a trip led by Pueblo member Ulysses Reid (June 18), or explore ancient villages around Vallecitos Pueblo, near present-day Jemez (July 22), on tours sponsored by the New Mexico Office of Archaeological Studies. 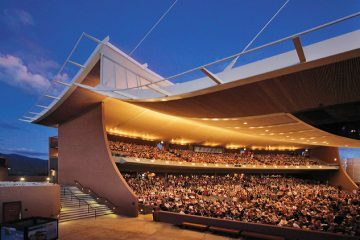 The big news in classical music is, of course, the opening of the 2017 Santa Fe Opera season, with five works in repertory, including the world premiere of the commissioned work The R(e)volution of Steve Jobs, along with Donizetti’s Lucia di Lammermoor, Handel’s Alcina, the classic Die Fledermaus, and Rimsky-Korsakov’s The Golden Cockerel. 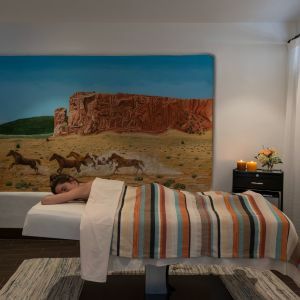 La Fonda is offering a special “Fond of the Opera” package that includes a pre-opera cocktail in La Fiesta and a backstage tour at the Santa Fe Opera. The Santa Fe Chamber Music Festival celebrates its 45th season (July 16-Aug. 21) with a concert lineup taking place primarily at the St. Francis Auditorium, as well as the Lensic. Santa Fe Desert Chorale also presents its 35th Summer Festival (July 19-Aug.13), made up of four distinct concert programs across five venues in Santa Fe and Albuquerque. New Mexico Performing Art Society holds its Season Finale Opera Concert, performed by the Bach Chorale (June 25), as well as a free concert by students in the group’s Santa Fe Flute Immersion master class, both at Immaculate Heart Chapel (June 4). 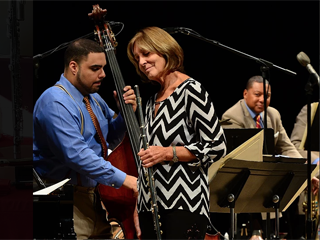 In contemporary music, there’s the 12th Annual New Mexico Jazz Festival, bringing A-list players to venues in Santa Fe and Albuquerque (July 13-Aug. 5), with free concerts at the Santa Fe Bandstand (July 25) and St. John’s College (July 19), among other places. 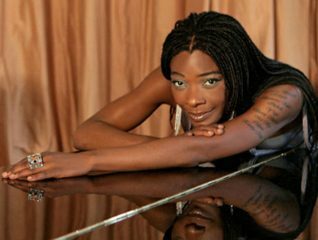 Buika plays the Lensic on July 28, followed by Pharaoh Sanders Quartet (July 29), with a free Meet the Jazz Master event for Lensic members. One of the best things about summer music in Santa Fe is that so much of it is free. 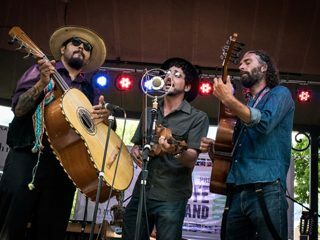 The Santa Fe Bandstand, of which La Fonda is a platinum sponsor this year, will again provide the best of local and national bands most every night in the Plaza, July 5 through Aug. 25; check the calendar for updates. St. John’s College begins its free Music on the Hill series June 14 with Ali Ryerson, continuing every Wednesday at 6 p.m. through July 26 on the college athletic field. 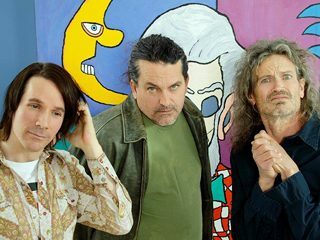 Railyard Park also has a free concert series, starting with Meat Puppets (June 3) and continuing with El Ten Eleven (June 10), Dumstaphunk (June 17), DakhaBrakha (June 24), Mariachi Flor de Toloache (July 1), The Ian Moore Band (July 8), Los Hacheros (July 22), The Gluey Brothers (July 28), and Kubo and the Two Strings (July 29). You can come see our own Bill Hearne, honored with his wife Bonnie, as the New Mexico Music Commission Foundation presents its 2017 Platinum Music Awards at the Lensic (July 21), celebrating the lifetime achievements of some of the state’s pioneering musicians. 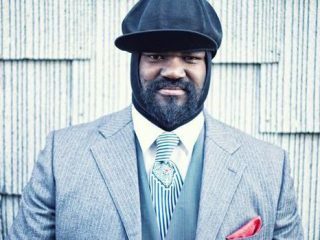 Also at the Lensic, catch Gregory Porter, the new king of vocal jazz, in his first appearance in the City Different (June 10), followed by the long-awaited return of guitar maestro Leo Kottke, together with singer-songwriter John Gorka (July 22). 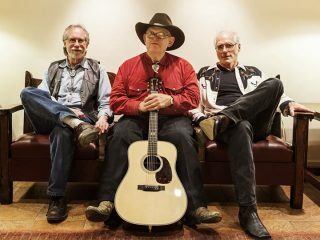 Elsewhere, there’s Dog Days of Summer at the Bridge at Santa Fe Brewing (June 4), followed by the North Mississippi Allstars (June 9). At the same venue, Dog Days of Summer is an afternoon-to-evening extravaganza of music and entertainment for the two- and four-legged, culminating with the internationally acclaimed, multimedia show put on by MarchFourth (June 4). At Meow Wolf, it’s Bad Suns (June 2), Danny Daze (June 3), and Hurray for the Riff Raff (June 6), followed by Machinedrum (June 16), whose lighting design is part of the Currents 2017 festival, and The Districts (June 29). 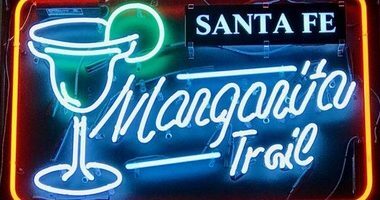 In July see Sian (July 8), Grupo Fantasma (July 15) and Beach Fossils (July 18). 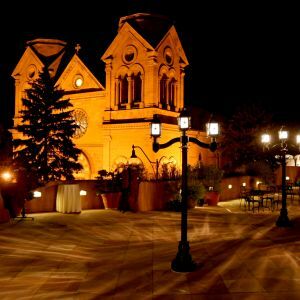 The Santa Fe Playhouse presents The Normal Heart, by Larry Kramer (June 8-25), followed by Kander, Ebb, and Masteroff’s Cabaret (July 20-Aug. 7). At the Adobe Rose Theatre, Donald Margulies’ Time Stands Still (through June 4) is followed by Building the Wall by Robert Schenkkan (June 15-July 2), one of the first five productions nationwide of this new work by the Pulitzer and Tony Award–winning playwright. 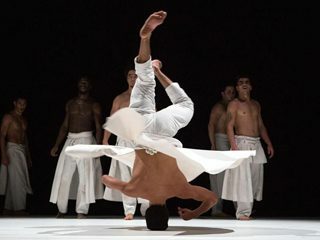 Aspen Santa Fe Ballet presents its summer show at the Lensic, with another world premiere by Brazilian choreographer Fernando Melo, along with Los Angeles choreographer Cherice Barton (July 15). They are also bringing to the Lensic Compagnie Hervé Koubi, a group of 12 gymnastically talented men from Algeria and Burkino Faso (July 23). Broadcasting from London to the Lensic is James Macdonald’s critically acclaimed production of Who’s Afraid of Virginia Woolf, from the Harold Pinter Theatre (June 3), followed by Peter Pan (June 11). 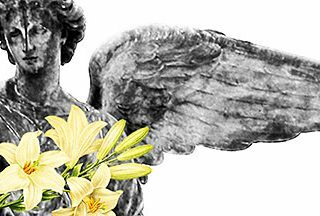 National Theatre Live in HD also presents Tony Kushner’s award-winning, two-part masterpiece Angels in America, in a new production by Marianne Elliott, over two evenings (July 26-27). Every other Friday through Aug. 25, Railyard Park offers free family movies outdoors, including Mary Poppins (June 2) and Fantastic Beasts and Where To Find Them (June 11), Best in Show (June 30), Happy Gilmore (July 14). Cinefesta Italia is an Italian film festival at the Jean Cocteau Cinema (June 1-4). If you hurry, you might be able to grab low-cost tickets to be part of the audience for the national PBS program The Majesty of Music and Math, a multimedia program featuring the Santa Fe Symphony and Santa Fe Institute at the Lensic (June 19). This summer, museums and the Santa Fe Desert Chorale are collaborating on Art of the Draw, a celebration of drawing, in conjunction with the Lines of Thought exhibition at the New Mexico Museum of Art. 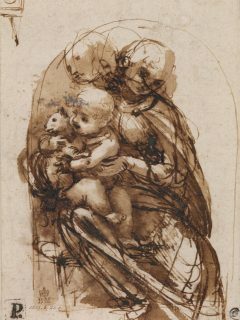 Santa Fe is one of only two venues nationwide to carry this exhibit featuring such drawing heavyweights as Da Vinci, Michelangelo, Durer and Picasso. Try your hand at the drawing exercises used by Georgia O’Keeffe during an evening workshop at her museum (June 15); watch two artists draw each other in the museum courtyard the first Sunday of each month, in an Artist’s Drawoff; or practice drawing with local artists on Friday afternoons during Summer Salon. 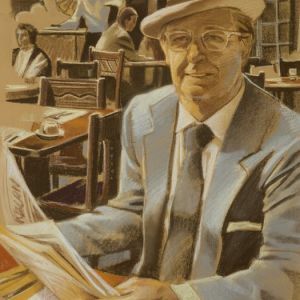 The New Mexico Museum of Art celebrates its centennial this year, and will honor its St. Francis Auditorium with a series of events starting with “Sombras del Pais,” a lecture-performance tribute to New Mexico folk musicians Felipe Delgado and Anna Maude Van Hoose (June 10). Come dance to classic rock and blues in the courtyard at Summer Stomp (June 30). The Museum of International Folk Art opens Quilts of Southwest China (July 9 to Jan. 21), an overlooked craft form that is getting renewed interest from scholars. Meet six millennial folk artists from New Mexico in a conversation about folk art and activism while you collaborate on an art piece (June 4). 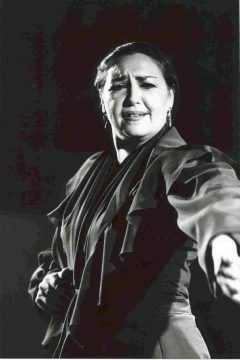 In conjunction with the exhibit Flamenco: From Spain to New Mexico, the museum is offering a series of classes in flamenco dance and castanets (June 27 through July 1), taught by Carmela Greco. Her guitarist Antonio Gabarri Jimenez will launch a series of live flamenco guitar concerts at the museum on July 1. The New Mexico History Museum opens an exhibit of historic photographs in Syria: Cultural Patrimony Under Threat (June 23 through Dec. 31). Take a guided tour of New Deal art and architecture in a daylong investigation of hidden Depression-era treasures (June 6), or visit one of New Mexico’s few remaining communes in Taos (July 15). Visit the museum on Father’s Day to turn an old cigar box into a gift for Dad (June 18) in a family workshop. 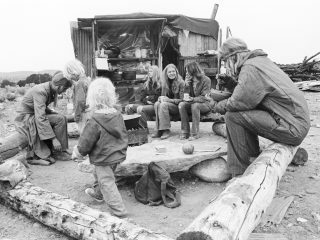 Or come relive the summers of love the second Saturday of every month (through February) as the museum hosts talk and conversation in conjunction with the exhibit Voices of Counterculture in the Southwest, starting with activist Yvonne Bond (June 10) and photographer Lisa Law (July 8). 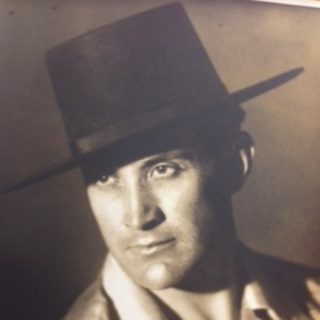 Meredith Davidson, who also was a contributor to La Fonda’s coffee table book, La Fonda Then & Now, curated this exhibit. The New Mexico History museum will also offer a free class on Kundalini Yoga every third Thursday (starting June 15) taught by Kirpal S. Khalsa. Santa Fe City Historian Ana Pacheco signs copies of her book Images of America: Early Santa Fe (June 16). The film Veiled Lightning, about the 1680 Pueblo Revolt, will be screened June 2, and the documentary Challah Rising in the Desert: The Jews of New Mexico, on June 25. The Museum of Indian Arts & Culture offers hands-on workshops for all ages in the summer known as ARTS Alive: pottery making (June 6), fabric stamping (June 8), Native American foods (June 13), and Native books (June 15), with free museum admission during the events. El Rancho de las Golondrinas starts its festival season with the annual Spring and Fiber Fest (June 3-4), Herb & Lavender Festival (June 17-18), and Viva Mexico Fiesta (June 22-23). A free discussion on “Creating global impact: Social innovation and cross-sector solutions” will take place at the Lensic (July 12) as part of programming for the International Folk Art Market. Another high-minded panel discussion takes place the following week on what it takes to become an interplanetary civilization (July 18). 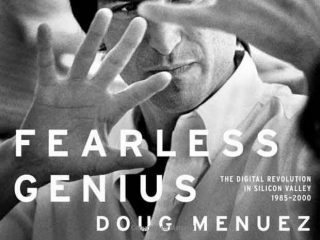 Then photographer Doug Menuez presents images from his book Fearless Genius, intimate images of Steve Jobs and other Silicon Valley pioneers (July 19) for Lensic members (or members-to-be! ).